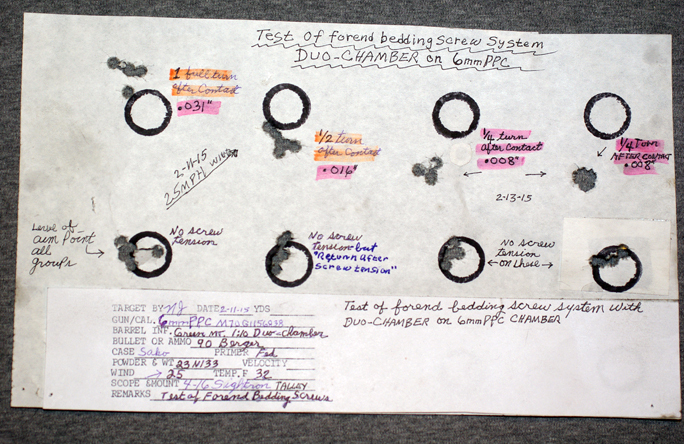 Series of groups made with the 6mm PPC cartridge and 90 grain Berger bullets while testing the forend bedding screw system made and installed by author. The lower row of four groups were all shot without forend screw pressure. The four upper corresponding groups were shot with varying bedding pressure, causing each group to rise. From upper left, one full screw turn (0.031”), one half screw turn (0.016”), and two on right with one-quarter turn screw pressure (0.008”). Accuracy of the last two groups showed improvement with optimal forend screw bedding adjustment. Finally, a quarter minute-of-angle group ensued, demonstrating the effects of a properly used forend bedding system. Some experimentation is necessary to determine if this bedding device will help on your rifle.